Want to have a deep fryer in your home? It’s perfect for the preparation of the occasional treat, those delicious French fries and some party snacks. Choosing the right appliance, however, is far from a simple task because the market has dozens of options to offer. When buying a deep fryer, you’ll need to pay attention to several things. The following guide will acquaint you with some of the biggest essentials. Fryers with a lockable lid: as the name suggests, these fryers have a lid that can be locked in place to boost the safety of the frying process. 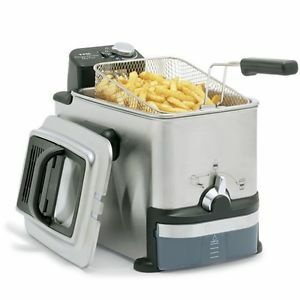 Many home cooks prefer this type of fryer. There’s no risk of having oil splashing around and potentially causing injuries or an accident. The basket can be put inside and raised without opening the lid. Lidless fryers: these deep fryers are either free from a lid or they have a lid that has to be removed to put the basket in and take it out. Such fryers tend to be less expensive than the ones that have a lockable lid and they’re also easier to clean (there are fewer components). On the downside, there’s serious risk of having to deal with hot oil splatters. Rotary fryers: a rotary fryer is another great pick because it uses a smaller amount of oil (approximately half) than the other two varieties. The basket where the food is placed will rotate inside the fryer, ensuring that all of the food is cooked evenly. You know which variety you’d like to buy and now it’s time to explore the other important features. The first one is the capacity of the fryer and it will be dependent on the number of people that you’ll be making food for. A fryer that has a single basket and a three-cup capacity is best for single individuals and for couples that don’t have kids. The next variety is the fryer that has capacity of eight cups. Such a fryer is ideal for families. It may have several frying compartments. Such a bigger fryer can also be used to prepare larger pieces of food like an entire chicken, for example. In some instances, the capacity will be determined by the pounds of oil (rather than cups) that it can hold. In this case, the smallest fryers are the ones that can hold approximately 1.5 pounds of oil. Temperature controls: having a fryer that features adjustable temperature is great for the preparation of different types of meals. An electric fryer that has a thermostat will certainly give you a bit of versatility. Nonstick interior: fryers that have nonstick interior are great for people that are just getting started with frying and for the ones that would like to simplify the cleaning process. Safety features: there are a few important safety features to look for. Cool wall fryers will have an exterior that remains cool to the touch throughout the cooking process. Having a viewing window on the lid is also a nice safety feature. Automatic switch off in the end of the cooking cycle reduces the risk of accidents even further. Ease of cleaning: fryers that have a bigger number of components are more difficult to clean. It’s a good idea to look for a fryer that has a drainage tube for the effortless removal of the oil. Fryers that have removable, dishwasher-safe parts are also perfect for at-home use. Remember that an inexpensive fryer may not be the best option. Look for the best price to quality ratio within your budget range. Don’t make a compromise with the safety features, if you want to enjoy delicious meals without jeopardizing your family. The market has dozens of good appliances, you’ll simply have to dedicate a bit of time to doing research and going through buyer testimonials.